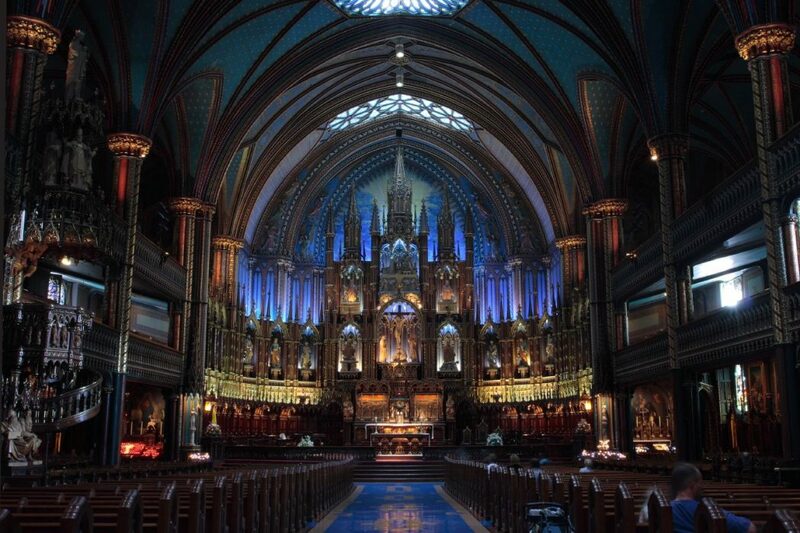 The iconic Notre Dame Basilica located in Old Port stands out as one of the “must-see” spots in Montreal. This gigantic basilica with towering steeples and intricate stained-glass windows appears to be a symbol of Montreal’s intertwined history with the Catholic church, standing out almost as much as the large cross that lights up Mont Royal. As one of Montreal’s most popular sites for tourists, I found it funny that I had never even stepped foot inside, despite moving to Montreal two years ago. Upon hearing about a new light show held in the basilica, I decided it was the perfect opportunity to finally check it out. I’ve always found walking around and admiring old sites such as this to be beautiful, but also somewhat stale. However, the Aura light show created a unique kind of experience that transformed this already amazing architectural site to a stage for a performance of light and sound. It’s hard to pay a lot of attention to detail and really be mesmerized in the traditional setting, but the show offers a chance to be completely immersed in the beauty and detail of Notre Dame’s stunning interior decor. Removing your sense of time with the all-encompassing features of the show truly makes a visit to this historical building a fun night out. Despite taking place in a Roman Catholic building, the show itself has nothing to do with religion, making it far more inclusive as it highlights various features of Notre Dame’s architectural detail. Removing your sense of time with the all-encompassing features of the show truly makes a visit to this historical building a fun night out. Even standing outside in line before the show places you in a different atmosphere than the norm, with the towering cathedral in front of you and the unique crowd. With the snow falling and the soft lighting of the beautiful plaza, the night already feels special and different. Soft chatter bubbles up, making the place seem more alive than it would be in the daytime. Everyone around is excited to be immersed in the show and to see the basilica illuminated in a new way. After wandering around inside for a bit, you sit in a pew in the middle of this grand basilica, and the show takes over. The middle-back section of pews is really the best spot to sit because you can see the projections rush over you without having to crane your neck back. Everyone is suddenly silent and there are no little screens distracting you from what is above. The whole point is to forget time and to not be on your phone or take photos. Instead, we’re instructed to just sit back and let it all hit you. Lasting around 20 minutes, you lean back and let yourself be mesmerized by the whole experience. The magical atmosphere that the show creates is powerful and makes you feel completely absorbed in the present. The loud music, perfectly in time with the visuals that are projected on the extravagant altar and arched ceiling, takes over your senses as the colours take turns revealing the details of the space. The whole time, your senses are stimulated, and your mind captivated by the well-orchestrated show. The magical atmosphere that the show creates is powerful and makes you feel completely absorbed in the present. This isn’t something you can watch on your screen. Sure, you could see Notre Dame’s interior through stunning photos, but you experience a very unique feeling being present. Being present and engaged in the tightly packed pews, with a mix of Montrealers and tourists speaking different languages yet all mesmerized by the same show, is an experience unlike any other. It’s an almost overwhelming feeling that is so different than your typical day to day routine that the experience, however short, sticks as something worth sharing. After the lights dim and the music fades, the whole crowd waits for a moment, letting themselves process what they’ve just experienced. The hauntingly beautiful music, the value of light, of colour, of volume and of timing; the totality of the experience just sits with you for a bit before you then move on with the rest of the crowd. If you have a friend visiting Montreal for the weekend or are just looking for something different, the Aura show in Notre Dame is a unique way to see such a picturesque and iconic Montreal site that I recommend doing at least once.